When a child comes out to his or her family, it becomes a tug-of-war between LGBT advocates and right wing extremists. The LGBT community seeks to provide love and accurate information to ease the coming out process. The Far Right often advises desperate parents to enroll their vulnerable children in damaging and ineffective “ex-gay” conversion camps. These programs peddle false hope by promising to turn gay or transgender kids into heterosexuals through prayer and quack therapy. 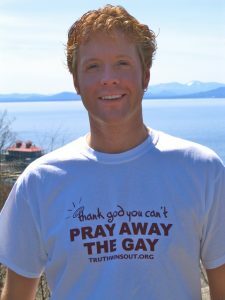 The mission of Truth Wins Out, a 501c3 non-profit organization based in Philadelphia, is to prevail in this tug-of-war, so we can save LGBT youth and their families the trauma of enduring these psychologically abusive conversion programs that don’t work and can lead to devastating consequences, such as severe depression, substance abuse, and even suicide. TWO goes undercover to expose “ex-gay” conversion leaders as hypocritical frauds that have not actually changed their sexual orientation. We highlight their bizarre methods, unscientific programs, and overwhelming failure rate. We are the organization that shuts these programs down. TWO has successfully fought to keep fraudulent and dangerous “ex-gay” conversion products out of the marketplace, including apps that could be downloaded by LGBT youth. TWO provides a platform for survivors of “ex-gay” conversion therapy, so they can warn of the pain and suffering they endured. This work also includes the stories of people who were trapped in marriages to “ex-gay” spouses who were supposedly “cured” but weren’t. TWO tells the stories of former leaders who once facilitated “ex-gay” conversion groups, who now renounce these programs as worthless and harmful. TWO provides original research on “ex-gay” conversion therapy groups. TWO educates and works with the media to ensure accurate reporting on “ex-gay” conversion therapy groups. We create a blizzard of news stories to ensure LGBT youth and their families have access to the truth about these harmful programs. TWO engages in direct action, organizing protests against “ex-gay” conferences across the country – from Alabama to Alaska. We elevate the voices of medical and mental health professionals who condemn “ex-gay” conversion therapy. “Ex-gay” conversion programs are particularly egregious because they seek to negate the very existence of LGBT people and strip them of their humanity. They falsely label LGBT people sick and sinful, while offering a justification for discrimination. The American Psychiatric Association says that attempts to change sexual orientation can lead to “anxiety, depression and self-destructive behavior,” including suicide. The American Psychological Association says, “There is simply no sufficiently scientifically sound evidence that sexual orientation can be changed.” Such “therapy” is considered so detrimental that sixteen states and the District of Colombia ban practicing it on minors. Truth Wins Out is in the vanguard of fighting these destructive programs. It is our goal to save lives and keep families strong and healthy. Please join our fight today and help us on our critically important mission.